The story of Robear’s Wrought Iron begins with the story of Robert “Robear” Hebert, born in Pierre Part, Louisiana. At the age of 12, Robear went to work with his father, Wilton, who was a commercial fisherman and very successful turtle farmer. Just a few short years later, after purchasing some welding equipment with money he had saved, Robear and his brother built (2) commercial boat trailers. Encouraged by this new endeavor, Robear attended a night school for welding for several years, eventually at the age of 19 becoming a member of Pipefitters Local Union 2258 out of Homer, Louisiana. As a welder, Robear worked on bridges, hospitals, a university library, a sea wall in Morgan City, LA, as well as seagoing vessels, and a number of other various construction projects. 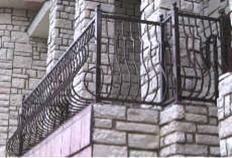 Robear moved to Warner Robins in 1993, where he tried his hand at several businesses before forming his own company, Robear’s New Orleans Style Wrought Iron in 1999. Robear considers himself a son of the Most High God, and has a deep and personal relationship with the Lord Jesus Christ. His building at 602 Watson Boulevard includes a 4,200 square foot retail showroom. He and his competent staff can handle projects on every scale, from the repair of common household items, to the construction of balconies, gates, fencing, railings, furniture and signage. Stop by and talk to Robear about your ideas, and let him help you make them a reality.